It was named Alice Springs after the wife of Charles Todd, the Superintendent of Telegraphs for South Australia. The story is that she was pretty good in bed. I'm not saying it is true. It was before my time. only 25,000 people? looks like the sort of basin which could become a super-city one day! daib0 wrote: only 25,000 people? looks like the sort of basin which could become a super-city one day! 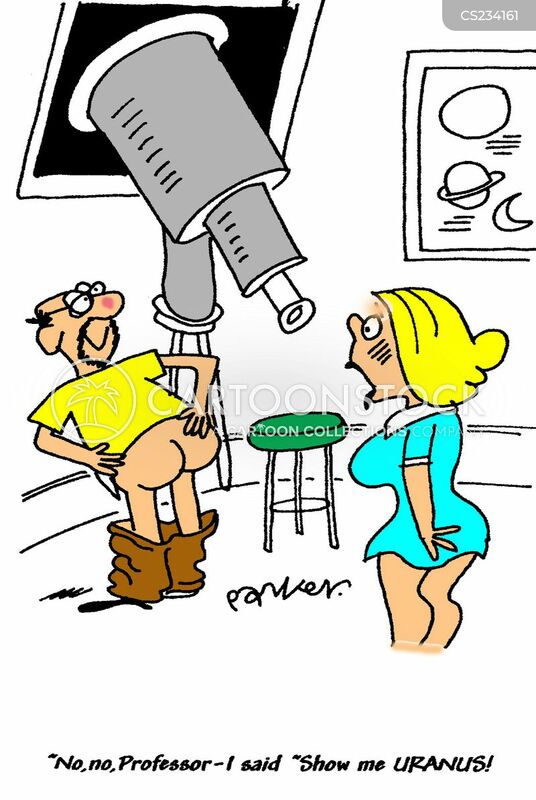 Tuesday, March 13, 1781. : Seventh planet from the sun, Uranus, is discovered. Uranus is the seventh planet from the sun, with its mean distance from the sun being 2869.6 million km. A gas giant, it is third largest by diameter and fourth largest by mass. Uranus is made up mostly of rocks and various ices, with only about 15% hydrogen and a little helium. The planet was discovered by William Herschel on 13 March 1781, who reported it on 26 April 1781. Prior to Herschel's discovery, the planet was mistakenly identified as a star. Herschel originally named it Georgium Sidus in honour of King George III of Great Britain but when it was noted that sidus means star and not planet, he renamed it the Georgian Planet, a name which was not accepted outside of Britain. Discussions amongs astronomers came up with a variety of names; the name Uranus was proposed by Johann Elert Bode, editor of the periodical, the 'Berliner Astronomisches Jahrbuch'. Because the name conformed to the classical mythology-derived names of other known planets, it was readily adopted by the scientific community. William Herschel is also credited with discovering two of Uranus's 27 known moons, Titania and Oberon, on 11 January 1787. Friday, March 14, 1879. : Physicist Albert Einstein is born. Albert Einstein was born on 14 March 1879 at Ulm in Baden-Württemberg, Germany. At six he began learning to play the violin and became a gifted amateur violinist, although it is said that once, in a violent temper, he threw a chair at his teacher. Einstein was considered a slow learner, possibly due to dyslexia, simple shyness, or the significantly rare and unusual structure of his brain, which upon his request was removed and examined after his death. There is a persistent rumour that he failed mathematics later in his education, but this is untrue; a change in the way grades were assigned caused confusion years later. Einstein was passionately interested in physics and mathematics and read eagerly in both subjects. He is perhaps best known for his development of the special and general theories of relativity. This theory considered all observers to be equivalent, not only those moving at a uniform speed. In general relativity, gravity is no longer a force, as it was in Newton's law of gravity, but is a consequence of the curvature of space-time. Einstein's equation E = mc2 proposed that the energy in matter is equal to its mass multiplied by the square of the velocity of light. This equation explained how stars, like our own sun, can emit large amounts of light while losing very little mass The equation also anticipated the splitting of the atom and led to the development of nuclear fission and the atomic bomb. Einstein won the Nobel Prize for Physics in 1921 for his explanation of the photoelectric effect. In the early years of the 20th century Einstein advanced theories that proposed entirely new ways of thinking about space, time, and gravitation and revolutionised scientific and philosophic inquiry. He died on 18 April 1955. 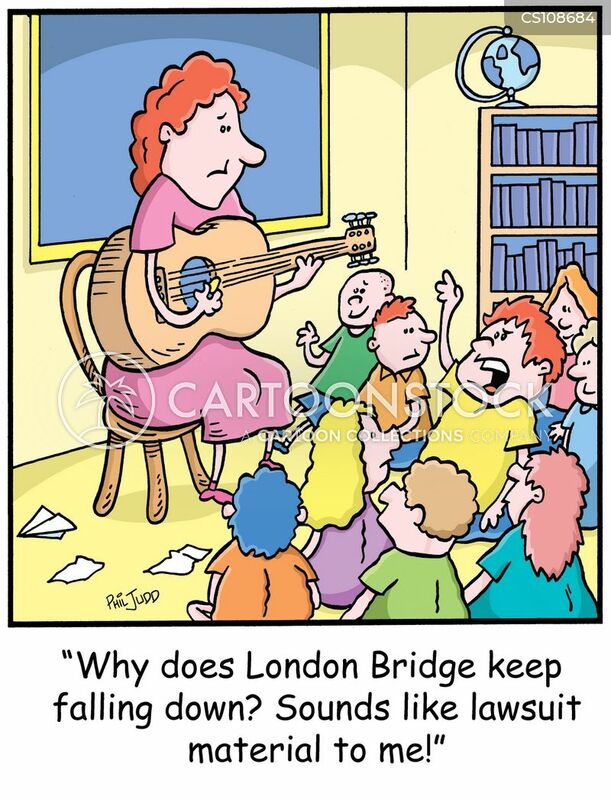 Friday, March 16, 1973. : The current London Bridge, the most recent of many, is opened by Queen Elizabeth II. There have been a number of different London Bridges over the past 2000 years. In 46AD, the Romans built the first bridge across the Thames River; it was a simple wooden construction which was burnt down in 1014. The replacement bridge was destroyed by a storm in 1091, and the next bridge after that was destroyed again by fire in 1136. Forty years later, a new stone bridge was constructed by Peter of Colechurch between 1176 and 1209. This bridge contained an intricate complex of houses, shops and a chapel, had 19 small arches and a drawbridge with a gatehouse at each end. It was so heavily populated that it was made a ward of the City with its own alderman. Due to the heavy population of the bridge, it suffered damage from many fires over the years, deaths from fire and deaths from drowning as the many arches produced vigorous rapids underneath. The houses were not removed from the bridge until the mid 1700s. By the early 1800s, traffic congestion and the dangers posed by the bridge prompted the necessity for a new bridge. Engineer John Rennie started construction in 1825 and finished the bridge in 1831. The design was superior, containing only five high arches, and constructed from strong Dartmoor granite. It was opened by King William the fourth in 1831. However, a necessary widening process some 70 years later weakened the bridge's foundations to the point where it began sinking an inch every eight years. In 1968, it was auctioned and sold for $2,460,000 to Robert McCulloch who moved it to Havasu City, Arizona, where it was rebuilt brick by brick, and finally opened and dedicated in October 1971. The current London Bridge was constructed by contractors John Mowlem from 1967 to 1972 and officially opened by Queen Elizabeth II on 16 March 1973. It was built in conjunction with the careful dismantling of the previous bridge, so that a river crossing was maintained in use at the site at all times. Sunday, March 18, 1990. : The first and only free elections in the history of East Germany are held, signalling the end of the country's existence. Following Germany's defeat in World War II, Germany was split into two separately controlled countries. West Germany, also known as the Federal Republic of Germany, was proclaimed on 23 May 1949, with Bonn as its capital. As a liberal parliamentary republic and part of NATO, the country maintained good relations with the Western Allies. East Germany, or the German Democratic Republic, was proclaimed in East Berlin on 7 October 1949. It adopted a socialist republic, and remained allied with the communist powers, being occupied by Soviet forces. The Soviet powers began to dwindle in the late 1980s, and the Communist Party in East Germany began to lose its grip on power. On 18 March 1990, the first and only free elections in the history of East Germany were held, producing a government whose major mandate was to negotiate an end to itself and its state. The German "Einigungsvertrag" (Unification Treaty) was signed on 31 August 1990 by representatives of West Germany and East Germany. German reunification took place on 3 October 1990, when the areas of the former East Germany ceased to exist, having been incorporated into The Federal Republic of Germany, or West Germany. Warning: this link doesn't take you to a historical site. Only click on it if you want to see beautiful German women. shouldn't put up links like that to distract us from the serious stuff (well, you should, but I then forget the serious stuff) !! daib0 wrote: shouldn't put up links like that to distract us from the serious stuff (well, you should, but I then forget the serious stuff) !! Well said, I think, what was the serious stuff again. Saturday, March 19, 1921. : Tommy Cooper, famous British comic, was born. British comedian Thomas Frederick "Tommy" Cooper was born in Caerphilly, South Wales on 19 March 1921. When he was three years old, his family moved to Exeter, Devon, where he acquired the West Country accent that became an integral part of his act. Cooper's interest in magical illusions developed when he was eight, and his aunt bought him a magic set. He perfected numerous magic tricks, which helped him to develop his comedy acts later on. Some accounts say his great sense of comedy grew out of the many conjuring tricks that failed when Cooper was performing to various audiences: despite the failures, his acts gained plenty of laughs. He soon learned that adding the occasional trick that worked added to the winning formula. Respected by traditional magicians and illusionists, Cooper became a member of The Magic Circle. His trademark was his red fez. Cooper's success began when, in 1947, he was booked by trombonist Miff Ferrie of "The Jackdaws" to appear as the second spot comedian in a show starring sand dance act "Marqueeze and the Dance of the Seven Veils". Over the next two years, Cooper performed in hundreds of shows. Ferrie, in fact, acted as Cooper's agent right up until Cooper died in 1984. This included during Cooper's television career, which began in 1948 and spanned almost four decades. After he first performed on the BBC talent show New to You in March 1948, he started starring in his own shows, and was particularly well known through his work with London Weekend Television from 1968 - 1972, and Thames Television from 1973 - 1980. 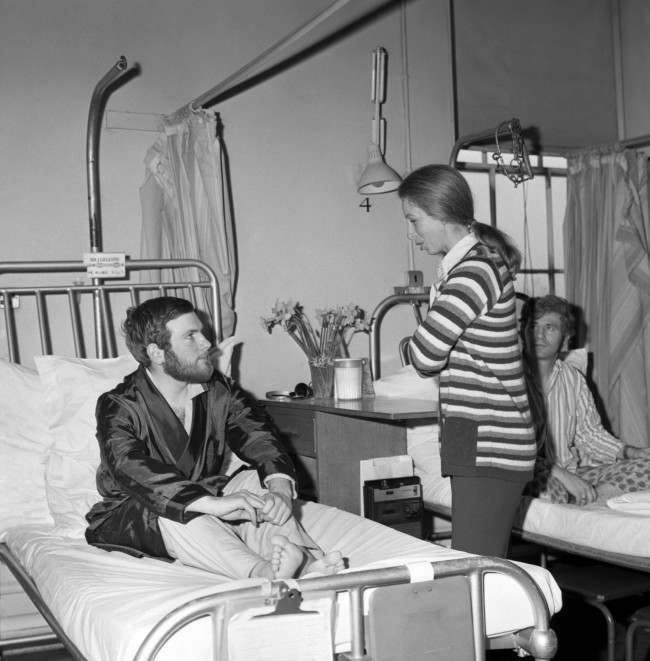 Wednesday, March 20, 1974. : An attempt was made to kidnap Princess Anne. Princess Anne, second child of the Queen of England, Elizabeth II, married Captain Mark Phillips in 1973. On 20 March 1974, less than four months after their marriage, Princess Anne was the target of a failed kidnap attempt. The Princess and her husband were returning to Buckingham Palace from an engagement when their chauffeur-driven limousine was blocked in the road on Pall Mall by another car. 26-year-old Ian Ball jumped from the car and fired six shots, wounding several people, including the chauffeur. It was later determined that Ball planned to ransom the Princess for £3 million. Inspector James Beaton, the Princess's private detective, jumped across to shield the princess, and then returned fire, injuring the kidnapper. A nearby police officer gave chase and arrested Ball, who was later sentenced to life imprisonment and placed in a mental hospital. The incident prompted higher security levels for the Royal Family. After the Reading FC inaugural match (a month earlier) had finished 0-0 against Reading Grammar School Football club, the organizers of both these sides decided to try again on this day in 1872 for a kind of ‘friendly replay’ – so this the SECOND ever match of my club. Incredibly, this also turned out a goal-less draw! 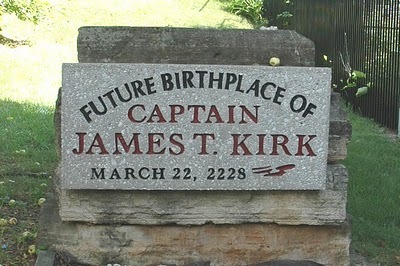 Thursday, March 21, 2233. : Captain James T Kirk of the Starship Enterprise will be born. Captain James Tiberius Kirk, played by actor William Shatner, is captain of the starship Enterprise in the fictitious Star Trek universe. According to speculative calculation, James T Kirk will be born in the town of Riverside, Iowa, United States, on 21 March 2233. The town of Riverside is already capitalising on the future birth of the famous captain. The town's summertime "Riverfest" has been altered to "Trek Fest", during which Trekkers flock to the streets in all manner of Star Trek garb, and a sign upon leaving the town proclaims "the Trek Begins". A concrete slab behind a former barber shop marks the site where Kirk will be born.